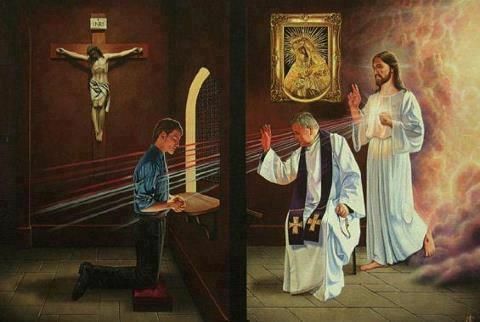 The Sacrament of Reconciliation, also called confession, is one of the most important sacraments of the church. This sacrament, one of the two sacraments of healing (the other being Anointing of the Sick), has a biblical basis and has been around since the beginning of the Catholic Church in 33 A.D. This post will discuss the basis of the sacrament biblically, the importance of the sacrament, and the history throughout the 2000 year history of the Church. We can quite clearly see that here Christ gives the authority to forgive sins to the Apostles. As we know, the Apostles chose successors. The power to forgive sins was then passed from the original apostles to their successors, the Bishops. The Bishops then delegated this power to Priests. This power has been passed down through the succession to the present day. The biblical basis of the sacrament is clearly laid out in scripture and as I will show in the next section, Tradition. “The Pontifex Maximus–that is, the bishop of bishops–issues an edict: ‘I remit, to such as have discharged (the requirements of) repentance, the sins both of adultery and of fornication. '” Tertullian, Modesty, 1 (A.D. 220). “In addition to these there is also a seventh, albeit hard and laborious: the remission of sins through penance…when he does not shrink from declaring his sin to a priest of the Lord.” Origen, Homilies on Leviticus, 2:4 (A.D. 248). “It is necessary to confess our sins to those whom the dispensation of God’s mysteries is entrusted.” Basil, Rule Briefly Treated, 288 (A.D. 374). “All mortal sins are to be submitted to the keys of the Church and all can be forgiven; but recourse to these keys is the only, the necessary, and the certain way to forgiveness. Unless those who are guilty of grievous sin have recourse to the power of the keys, they cannot hope for eternal salvation. Open your lips, them, and confess your sins to the priest. Confession alone is the true gate to Heaven.” Augustine, Christian Combat (A.D. 397). The Sacrament of Reconciliation does wonders to us. First of all, it restores us to the state of grace. By sinning mortally, we fall from the state of grace. The Church teaches that if we die with a mortal sin on our soul we will go to hell. All sins are forgiven in the sacrament. By forgiving our sins, we are saved from the fires of hell through reconciliation by Jesus. Many Catholics don’t go to confession. Some are scared to tell their worst sins, some do not think they need confession, and others say that they can confess directly to God. Confession is what Jesus set up on earth for the forgiveness of sins. 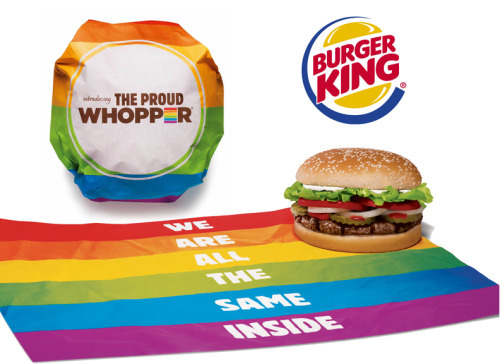 The Burger King publicity stunt of releasing “The Proud Whopper” and the phrase it used, “We’re all the same inside,” is yet another example of the irrational “acceptance culture” which I have written of previously. “We’re all the same inside” proposes that anatomical similarity serves as justification for actions. Homosexuals, bisexuals, and psychopaths are all perfectly capable of not acting in accordance with their already present mental state. This has been proven many times over. Yet the argument of “you can’t control who you are” is repeated over and over again. You can, in fact, control who you are to some extant. You can control your actions, which, in the end, is the real determining factor of who you are as a person. Sorry for the short post. I’m lacking ideas and motivation lately, but this gay acceptance argument was also pretty easy to discredit. 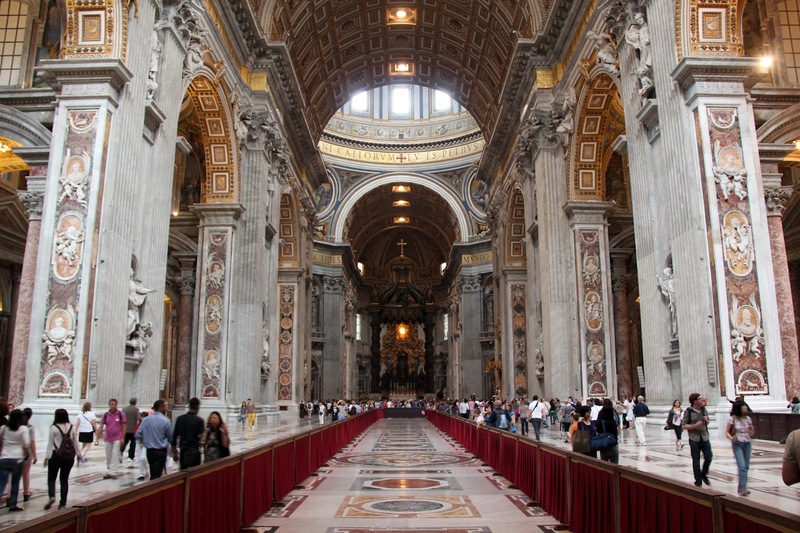 One of the most commonly repeated criticisms of the Catholic Church, by both Christians and non-Christians alike, is the amount of time and money the Church puts into its basilicas, such as St. Peter’s in the Vatican. Critics of the basilicas claim they serve as a massive testament to church greed. However, these claims are made in a blind ignorance to truth. The claim that the Catholic Church indulges in greed is simply not supported in any way by the Church’s spending history. The Catholic Church spends about $11,350,000,000 every year on its churches, schools, parish related properties, and the Vatican combined. That’s a minor 6.6% of total spending. Meanwhile, the other $160,250,000,000 (93.4% of spending) goes to hospitals, colleges/universities, and various charities. Simply put, the Catholic Church is the largest charitable organization on the planet. Should that 6.6% Be Donated As Well? The wealth here is the wealth used to build basilicas, monolithic structures constructed to worship God and honor the Saints. It is because of their purpose to worship God that the wealth is justly kept and spent. The Bible specifically condones the use of wealth for the worship of God in The Gospel of John. Furthermore, God demands his houses of worship be beautiful in The Book of Exodus 25-26, even if that house of worship be only a simple tent in the desert. Also, the Temple in Jerusalem was adorned with gems and gold, as evident in The First Book of Kings 6 as well as The Second Book of Chronicles 3. Extravagant Churches are explicitly biblical.